How much of what we are calling psychiatric pathology is in fact thyroid disorder? I’m sitting on the edge of my seat as I prepare Dr. Kelly Brogan’s guest article for Hypothyroid Mom. Her question has my mind reeling. 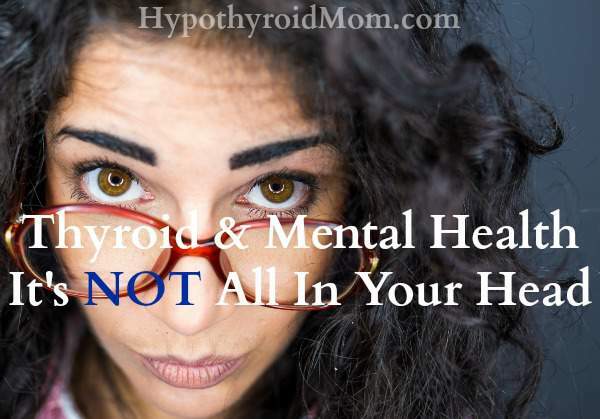 How many of my fellow Hypothyroid Mom followers are diagnosed with mental health illnesses? Could some or many of them be misdiagnosed? Could these symptoms be a red flag that somewhere deep in their body their soul is waving up in the air trying to alert the person, the doctor, someone, that their thyroid condition is undiagnosed or inadequately treated? Depression has become an epidemic in which psychiatrists are infamous for saying “oops” and quickly writing a prescription. We have bought into a disease-medication model, driven by the holy placebo-controlled trial. This is the language that doctors speak, and anything else is considered gibberish. We work with one-size-fits-all interventions and reduce patients to their indication, or diagnosis. We tell ourselves that the algorithm works when it is “evidence-based”. What does this mean when we see that the house of cards has been glued into its position? Meta-analyses conducted by Kirsch, et al. have demonstrated the power of the placebo effect in randomized antidepressant treatment trials. Kirsch alleges that the placebo effect alone may account for up to 75% of the treatment effect of active medication exposure. Kirsch is one of many to expose the 40% of funding to the FDA that comes from pharmaceutical companies, and the fact that, despite registration of studies, data is still manipulated, cherry-picked, and redundantly submitted. He also supports a claim posited by Fournier, et al. that antidepressants only separate from placebo in the setting of severe depression. However, he observes that this effect is miniscule, at best. This corruption of data and misattribution of benefit to pharmaceutical interventions is not just psychiatry’s problem. The problem is not just with the drug companies and the researchers, but with the whole system — the granting institutions, the research labs, the journals, the professional societies, and the many strands of this complex web. What’s thyroid got to do with it? On a routine physical, there it was, in black and white: Postpartum thyroiditis or Hashimoto’s with a TSH (Thyroid Stimulating Hormone) of 20 and antibodies in the thousands. Four and a half years and one pregnancy later, I am prescription free with normal antibodies and optimal TSH…I’m allowed to brag because it required persistence and commitment to a new lifestyle, and I’ve never looked back. Thyroid disease is one of the primary contributors to psychiatric diagnoses that has a physiologic explanation, which I call Psychiatric Pretender. 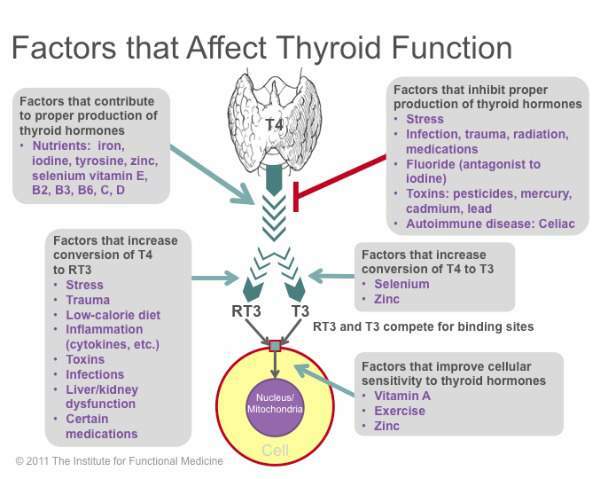 Thyroid function is near and dear to my heart and is a big focus in my Manhattan psychiatric practice as well as in my New York Times bestselling book A Mind of Your Own. I will use postpartum thyroiditis, which I encounter in about 80% of my patients, as an example to illustrate how thyroid can really masquerade as a psychiatric condition. In the postpartum period what happens is the immune system undergoes a shift after the birth of the baby. There is a pattern of hyperthyroidism over a couple of months followed by hypothyroidism, low functioning of the thyroid. This pattern is exacted by the immune system, it’s attack on the gland. What happens in those early months after giving birth is the patient will typically feel like they’ve bounced back really easily, they’ve lost the baby weight, they have a ton of energy even though they are only sleeping 2 or 3 hours a night, but there might a dark edge where they are agitated or irritable and they have a racing heart and insomnia. If you were to check their blood work then, you would find the presence of these antibodies. They have 3 different names, although usually there is a specific pattern where only 1 or 2 of them are present – Thyroid Peroxidase Antibodies, Thyroglobulin Antibodies, and Thyroid Stimulating Immunoglobulin (or Thyroid Stimulating Hormone Receptor Antibody). The TSH, which is typically the only thing that’s checked may actually be low or normal, but we have a harbinger of what’s to come which is over the course of a couple of months something that looks a lot like major depression or postpartum depression. It’s cloudy thinking, feeling slowed and lethargic, weight gain, sometimes constipation, excessive hair loss, dry skin, and depression punctuated with little pockets of tense anxiety that can actually manifest in the body as racing heart and a feeling of inner restlessness. The reason I care so much about this is because if you didn’t look for the evidence of thyroid function specifically autoimmune thyroid function, then you would presume that these are manifestations of brain-based chemical imbalance. There are strategies for resolving autoimmune conditions from a functional medicine perspective that involve targeted nutrients things like selenium, zinc, probiotics. Often the most important aspect of the treatment is looking to the environment to find out what might be aggravating the situation or driving this autoimmunity. The big ticket items are usually food intolerances (things like gluten and dairy) and sometimes environmental endocrine disruptors like fluoride and plastics. It turns out this is a hard question to answer because of limitations in conventional diagnostics which typically consist of only one blood test called the TSH and in conventional treatment which typically only consists of replacement of synthetic thyroid hormone (T4). This paradigm neglects and dismisses the complex interplay between the brain, hormone levels, glands, receptive tissues, mitochondria, the immune system, and the pivotal role of the gut, diet, and environmental exposures. The problem with this limited conventional paradigm is that patients are left suffering with chronic symptoms of fatigue, insomnia, brain fog, lethargy, depression, anxiety, and changes in metabolism. They are told that they are “fine”. They are referred to a psychiatrist or they are treated by a non-specialiast with psychiatric medication often for a lifetime in total neglect of the root cause of their symptoms. Perhaps the most important consideration when it comes to root causes is that of autoimmunity, which is when the immune system selectively targets in this case a gland for destruction. I have a personal and professional vested interest in autoimmune thyroid dysfunction, whether it’s Graves’ disease, Hashimoto’s or postpartum thyroiditis. I’ve been following the literature that suggests that 20% of patients with depression have thyroid antibodies, that 52% of these patients have subclinical hypothyroidism (a type of hypothyroidism that would not be detected with conventional testing), that in pregnancy the presence of thyroid autoantibodies alone not only predicts adverse neonatal and obstetrical outcomes but also postpartum depression and even postpartum psychosis, and that an intervention as simple as 200 micrograms of selenium a day can improve those thyroid autoantibody levels, and that in what we are calling bipolar mania signs and symptoms of hyperthyroidism have been documented which calls into question the use of thyrotoxic medications such as lithium in these patients, and that over the years placebo-controlled randomized trials have demonstrated active thyroid hormone (T3) is an effective mood stabilizer. But if we are going to think about the root cause of these symptoms we have to look at the whole person and we have to look at the web of influence, whether it’s macro or micro nutrient content of their diet, exposure to food antigens such as gluten, environmental exposure such as fluoride, metals, and endocrine-disrupting plastics, and even medications like oral contraceptives. It’s only when we use a whole body approach to psychiatry and look at the whole person and all of these influences and exposures do we have the opportunity for lasting resolution of symptoms. 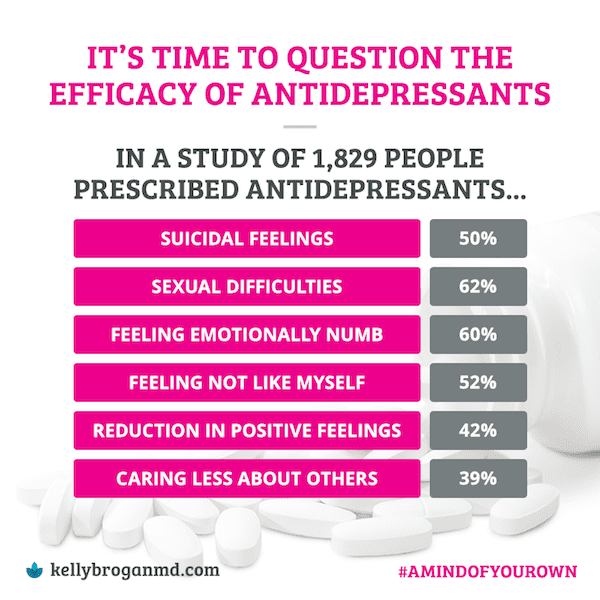 Dr. Kelly Brogan is a Manhattan-based holistic women’s health psychiatrist, and author of the New York Times bestseller, A Mind of Your Own: The Truth About Depression and How Women Can Heal Their Bodies to Reclaim Their Lives . She completed her psychiatric training and fellowship at NYU Medical Center after graduating from Cornell University Medical College, and has a B.S. from MIT in Systems Neuroscience. She is board certified in psychiatry, psychosomatic medicine, and integrative holistic medicine, and is specialized in a root-cause resolution approach to psychiatric syndromes and symptoms. READ NEXT: Mental Disorder or Undiagnosed Hypothyroidism? …. I found out mt lower back has an old fracture. Later gynecologist treated with birth control for hormone regulation.. I’m off of that for over a year. This all really makes so much sense to me now I wish I could find a doctor like you in my area 22 years ago I had a half a pound baby girl do to toxemia. Soon after I was diagnosed what’s an anxiety disorder and put on meds. I have since gained about 50 something pounds and still on the same anxiety meds and now I’m on thyroid medicine as well. Having lost my first Mum at 3 years of age from suicide and having got problems of depression in my family (my two siblings), the doctors pretended that I was again in depression in 2018 when my mood was going down after having lost my job. In nov 2017 the doctor changed my dose of thyroxine from 150 to 125. I was again suicidal and in very very bad conditions. Taken to hospital several times and even one month again in psy ward in May 2018. In June the doctor stopped Praaosin that was prescribed by the psy at hospital since I got diziness. It helped a little bit but I got still some imbalance, some tremors and didn’t feel ok. Dr said you have to find the strength in yourself. I will, he said, asked a thyroid test….. it came back with a TSH of 14.4 ( from 5.9 in April, to 6.9 in May to 14.4 in July). I reckon it’s the moment they finally started to be scared. They increased my dose of thyroxine (EUtrosixg) from 150 every day to 150 /200 every other day. And …. do you know what …. I got the results today after having waited for 6 weeks (thyroxine has to pile in the system), from tsh 14.4 big hypothyroidism I have become just a bit hyper. (tsh 0.7), dr has asked to take 150 5 times a week and 200 twice a week. BUT the big solution is there … no imbalance anymore, no diziness anymore. I’m back to my ownself. I will have to have a tooth removed as well since I’ve got an infection and it could be as well the reason of the brainfog. Conclusion : when dr and other psychiatrists say that you’ve got mental illness, PLEASE, PLEASE, PLEASE ASK FIRST A THYROID TEST AND GO TO YOUR DENTIST TO HAVE ALL YOUR TEETH CHECKED. It will avoid you the jail that is psychiatrist ward, avoid you the ongoing stress, could save even your job. I beg you to have these two tests not only for your own sake but for what it cost Medicare !!!! I’m sorry to hear all you’ve been through Genevieve. Thank you for sharing your story. Our thyroid can wreak havoc on our brain but the mention of teeth reminds me of an article that I plan to post at Hypothyroid Mom in the coming months.